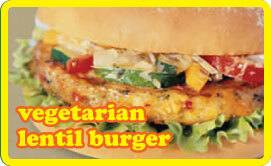 I never thought I’d be eating, let alone cooking, a vegetarian burger. But due to a surplus of lentils in the house I decided to give it a go. They have a slight Indian influence, but the indian version of lentil patties use a lot more spice and heat. These are easier to make and involve much less farting about with spice. Obviously they’re not as good as a beef or lamb burger, but for what they are they’re great! Brilliant on the BBQ. Simmer the lentils in boiling water for about 8 minutes until they are tender. Drain well. Heat the oil in a large pan and cook the onions and salt for 4-5 minutes until tender. Add the curry powder and stir for 1 minute until fragrant. Season with black pepper. Remove from heat. In a food processor or with a hand blender, blend into a smooth paste the chickpeas, half the cooked lentils, ginger, egg, and onions. Transfer to a large bowl and add the breadcrumbs, coriander, parsley and the remaining lentils. Divide the mixture into 10 portions and shape into burgers. Arrane on a plate and leave in the fridge for 20 minutes to firm. Just before cooking, toss the beuger in flour to coat. Heat a large pan or BBQ, lightly oiled. Cook the burger for 4-5 minutes either side until browned. We ate with a tomato chutney, on a massive burger roll. We also ate them again with a little sauce from a curry I’d made and rice.